1. Name a marketing template available on Broker Create? 2. In 3 words how would you describe the new Broker Mentor website? These terms and conditions apply to the ‘Win one of three Autumn Sleekster boxes of chocolates from Hotel Chocolat prize draw’ (“the Promotion”) and entry to the Promotion is acceptance of these terms and conditions. Therefore, please read these carefully. The Promotion will run from Thursday 1 November to close at 11:59pm on 16 November 2018 (“the Closing Date”). The Promoter of this Promotion is Aviva Insurance Limited, registered in Scotland, registered number 2116, registered office: Pitheavlis, Perth, Scotland, PH2 0NH (“the Promoter”). The Promotion is only available to all employees of insurance intermediaries who are working with the Promoter, who are set up with a valid Aviva agency reference and who are over the age of 18. The Promotion is excluded to employees (or family members of employees) of the Promoter, its agencies, its group companies or anyone else connected with the Promotion. Entries to this Promotion can only be accepted by completing and submitting your entry using the entry form, via the dedicated entry page on the Broker Marketing Mentor website (https://www.brokermentor.co.uk/). Only one entry per person can be submitted and entries on behalf of another person will not be accepted. No purchase is necessary. Responsibility will not be accepted for entries lost, delayed, mislaid or damaged when sent. Proof of e-mailing/posting will not be accepted as proof of delivery. Entries that are altered, illegible or not in accordance with the rules of entry will be disqualified. Three winners will be selected at random on Monday 19 November 2018 (the “Prize Draw”). 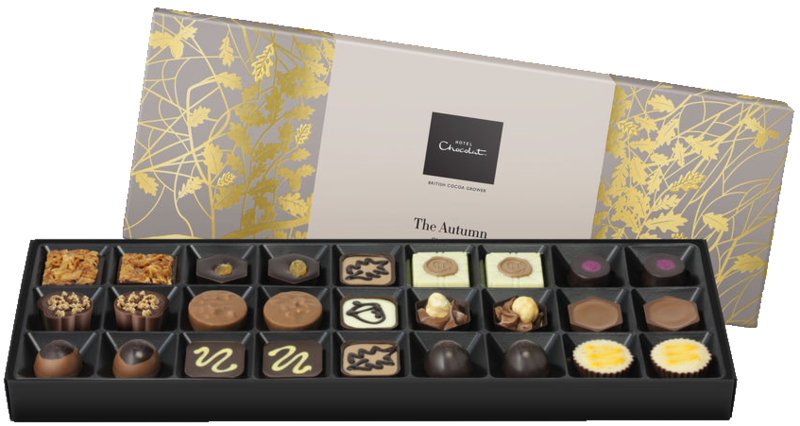 Each of the three winners will receive The Autumn Sleekster box of chocolates from Hotel Chocolat containing 27 chocolates (the “Prize”). Only one Prize will be awarded to any one person. The Prize is supplied by a third party. The Prize may be subject to restrictions and terms issued by their respective provider(s) which you must accept before accessing such product. The Prize Draw result is final and no correspondence shall be entered into. The Prize is non-exchangeable, non-transferable, not for resale, not redeemable for other prizes and no cash alternative will be offered. The winners will be notified by email within 5 days of the relevant date and will be given details of how to claim their Prize. If they do not respond within 21 days of the time of notification, then the prize will be forfeited and the Promoter will be entitled to select another winner (and that winner will have to respond to the email sent to them by the Promoter within 21 days of being notified). Each Prize will be issued to the winner within 28 days from the date of the Prize Draw. The name of each winner will be available on request for 6 weeks after the closing date by sending a stamped addressed envelope to Maria Ketteringham, Broker Marketing, Rosso 0, Surrey Street, Norwich NR1 3NS. Each winner agrees to have their name disclosed for this purpose. Each winner agrees to take part in post-Promotion activity. The Promotor may ask any of the winners to provide proof of age, employee status of the insurance intermediary working with Promoter who are set up with a valid Aviva agency reference and/or their country of residence. The Promoter accepts no responsibility for any costs associated with the Prize and that are not specifically and expressly included within the Prize description under these terms and conditions. Nothing in these terms and conditions shall exclude the liability of the Promoter for death or personal injury as a result of its negligence, fraud or fraudulent misrepresentation. Subject to the above, the Promoter accepts no responsibility for any damage, loss, liabilities, injury or disappointment incurred or suffered by you as a result of entering the Promotion or accepting the Prize. The Promoter shall not be liable for failure to comply with its obligations where the failure is caused by something outside its reasonable control. The Promoter disclaims liability for any damage to your or any other person’s computer relating to or resulting from the participation in or downloading any materials in connection with the Promotion. The Promoter retains the right to substitute the Prize with a prize of similar value in the event that the original Prize offered is not available.